The congregation remains standing; Kyle leads from the Table. Please, O Lord, please give us success! The Lord is God, and has given us light. O give thanks to the Lord, for God is good. admitting our faults and asking forgiveness. Almighty God, we confess how hard it is for us to be your people. to our lonely and confused world. renew our zeal for the building of your reign. A period of silent confession follows. who has enabled you to share in the inheritance of the saints in the light. Believe this good news and live in peace. In Jesus Christ we are forgiven. Kyle invites the congregation to stand to sing. Therefore, in his name, let us offer to one another a sign of Christ’s peace. An appropriate word and/or gesture may be offered to your neighbor to convey to them your hope that they may have the peace of Christ. Kyle sits with the worship leaders; Lucie goes to the pulpit to read. Listen for the Word of God from the book of the prophet Habakkuk. Lucie returns to her seat; Lois goes to the pulpit to read. Listen for the Word of God in this story from the gospel of our Lord Jesus Christ according to Mark. so that they might go and anoint him. they went to the tomb. "Who will roll away the stone for us from the entrance to the tomb?" sitting on the right side; and they were alarmed. you are looking for Jesus of Nazareth, who was crucified. Look, there is the place they laid him. there you will see him, just as he told you." and they said nothing to anyone, for they were afraid. This is the Good News of our Lord Jesus Christ. Kyle leads the congregation in standing for the hymn. For permission to use this hymn, contact Hope Publishing Company, or consult your LicenSing, CCLI, or OneLicense catalogs. into a specialized ministry of Christ’s holy church. through the ages calling men and women to serve. and to love and serve those with whom they live and work. We are ambassadors for Christ, who reconciles and makes whole. We are the salt of the earth; we are the light of the world. Christ gave gifts to the church. which enables the whole mission of the church. we are also thankful for an important ministry just completed. making a part-time job into a full ministry among us and on our behalf. I would like him to rise so the Synod may show its appreciation. by the Regional Synod of Albany to be its Synod Executive. We invite you to come forward, Harold, as a sign that you accept this ministry. The members of Rochester Classis gather behind the communion table. The candidate, escorted by his wife and members of the Pultneyville Consistory, comes and stands, facing the presiding officer and the classis. Specialized ministers are called to build up Christ’s church. baptizing and presiding at the Lord’s Supper. serving with the whole church in its ministry to the world. at your ordination as a minister of Word and sacrament. your faith in one God, Father, Son, and Holy Spirit? Harold: Yes, truly, with all my heart. confessing our faith in the words of the Apostles’ Creed. The congregation is seated; the Harold shall remain standing and give the answers in bold. and therefore by God, to this ministry of Word and sacrament? and the perfect doctrine of salvation, rejecting all contrary beliefs? upholding the witness of Holy Scripture against all schisms and heresies? and in your use of the means of grace? in faithful service and holy living? should you become delinquent in either life or doctrine? here and throughout the world? and to shepherd the flock faithfully? Steve shall stand with the Classis. Daniel M. shall go to the pulpit and give the charge to the minister. The charge which follows shall be read. "Harold Delhagen, I charge you to be a prophet, priest, and king. And I charge you to practice faith and hope and love. Be a prophet and work by faith. Now faith is the substance of things hoped for, the evi­dence of things not seen. You have watched these churches in the Synod of Albany, their pastors and their consistories and their houses of worship. Now be for them a prophet and see them with the eyes of faith. See beneath their surfaces and tell them what you see, see the saints who have gone before them and have given them so much, and tell them what you see, see the future that lies before them, waiting with Christ, and tell them what you see. Speak to them of many things, but when you speak to them as a prophet, tell them of those things which faith sees. Only faith can see how the kingdom of God is already among them as something they need only receive, and only a prophet can explain how to receive it with both humility and pride, in both repentance and joy. Be a priest and work by hope. To live by hope requires sacrifice, the sacrifice of comfort and contentment with the present. I charge you as a priest to offer your own life as a sacrifice of thanksgiving. I charge you as a priest to offer the sacrifice of incense and convert your hopes for the synod into intercessions, that you have a place of incense in your study and that you cycle through intercessions for every church and every pastor every week. I charge you as a priest to offer the sacrifice of your mind in preaching to them and teaching them, and to offer the sacrifice of praise when you break bread with them, that they might recognize the Lord Jesus and they might be comforted by the hope that is in you. given to your care by the Holy Spirit. Love Christ: feed his lambs, tend his sheep. Be an example in speech, in conduct, in love, in faith, in purity. Attend to reading, prayer, study, preaching, and teaching. so that all may see your progress. for in doing this you will save both yourself and your hearers. Harold, guard what has been entrusted to you. you will win the crown of glory that never fades away. Daniel M. returns to his seat; Dan G. addresses the Synod; Harold moves to face the congregation, with Rochester Classis delegates behind him. Will the classis presidents please stand? Steve stands with the other presidents. working with him and listening to the prophetic voice God gives him? Will the members of the Synod staff please rise? sharing your gifts and wisdom and humbly accepting his? whom God has given us? this servant Harold to be our Synod Executive? and welcome his pastoral care as a representative of Jesus Christ? as you labor together for the welfare of the world? that he may serve among you with joy and not with grief? The congregation (including Dan G. and Harold) is seated; Ellen goes to the pulpit and gives a brief, scriptural charge to the Synod. A harvest of righteousness in the kingdom of God. Think about it! All over Albany Synod, kingdom gardens…producing the harvest of righteousness. Just think of it, when Harold comes to visit, we will show him the garden! And when we send him emails or letters, we’ll want to include a photo of the garden—the Kingdom garden. And after a while, we’ll celebrate together the harvest of righteousness that comes through Jesus Christ. I wonder…. what seeds will we plant in the kingdom garden? Jesus said that the kingdom of God is like a mustard seed, which, when sown upon the ground, is the smallest of all the seeds on earth: yet when it is sown, it grows up and becomes the greatest of all shrubs, And puts forth large branches, so that the birds of the air can make nests in its shade. He also said that the kingdom of God is as if someone would scatter seed on the ground, and would sleep and rise night and day, and the seed would sprout and grow, he does not know how. The earth produces of itself, first the stalk, then the head, then the full grain in the head. But when the grain is ripe, at once he goes in with his sickle, because the harvest has come. As we receive with joy Harold Delhagen as Synod Executive for the Synod of Albany, let us remember together, it is our Father’s good pleasure to give us the kingdom. To God be all glory and praise, now and forever." of the Regional Synod of Albany. Steve returns to his seat. Harold stands, and Lois and Dan G. remove the stole Harold is wearing and place the new stole on him, then all three return to their seats. Paul gives us these words in the letter to the Romans. Let us now present our offerings of thanksgiving to God. As the offerings are gathered the organist will play. 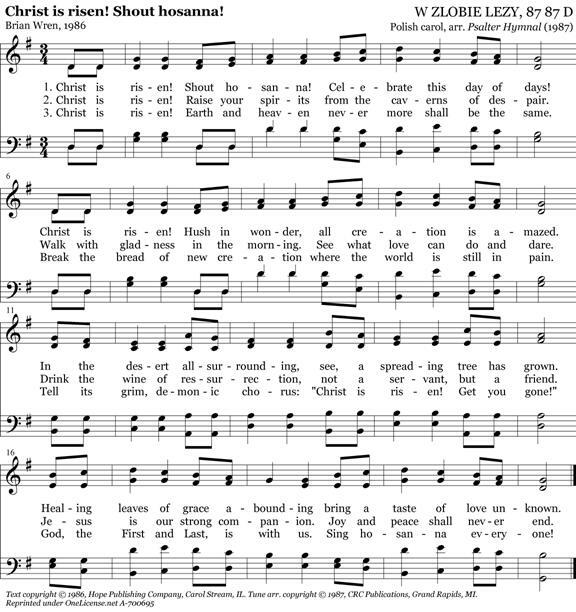 The elements for the Lord’s Supper will be brought forward with the offering while we sing. and our resolve to walk together in your way. Accept us and our offering, we pray, for Jesus’ sake. Amen. The congregation is seated. Wes takes the offering plates and stacks them, and places the communion elements on the table, then he and the ushers take their seats. Harold, Craig, Jan, and three Scotia elders stand at the communion table. is a feast of remembrance, of communion, and of hope. We come to remember: Christ was sent by God to die for our sins. We come for communion: Christ has promised to be with us always. We share him in bread and cup. of the feast we will share in the New Creation. one with him, with each other and with all God’s saints. Come, for all things are now ready! Lift up your hearts! We lift them up to the Lord. Let us give thanks to the Lord our God. For it is holy and right to do so. even when we fell into sin. opened to us the way of everlasting life. to proclaim the glory of your name. for the sin of the whole world. and we offer our prayers. may he herald the joy of your kingdom, serving rather than being served. Give your grace to this Synod. use us to extend your reign of justice and peace. Inspire your whole church with your Spirit of power, unity, and peace. Lead all nations in the way of justice. that the world may know your true peace. Make us instruments of your wholeness and peace in their lives. the communion of the body and blood of our Lord Jesus Christ. and remain faithful in hope and love. into the glory of your kingdom. The cup of blessing which we bless is the communion of the blood of Christ. Jan and Harold, each accompanied by an elder, form two stations in the front of the sanctuary to serve communion by intinction; the congregation proceeds up the central aisle to the stations, returning by the side aisles; those in the back of the nave will go first, moving to the front, then those from the balcony. Craig and the third elder serve the choir. let us stand and praise God’s holy name with heartfelt thanksgiving! and to give thanks for all of life. 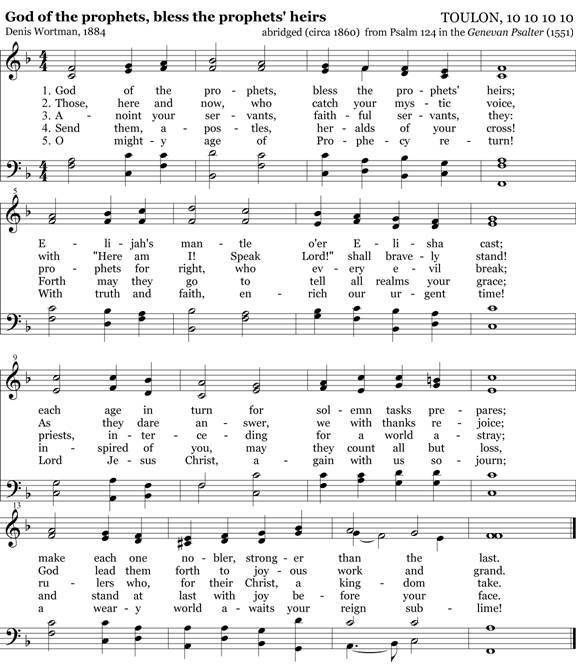 For permission to use this hymn, contact the Church of Scotland Panel on Worship, or consult your CCLI, LicenSing, or OneLicense catalogs.